Last summer, after hearing the sounds of whining and weeping coming from a close property, a Detroit resident immediately called The Michigan Humane Society asking for help. His neighborhood had recently undergone heavy rainstorms, so he recognized that whatever was making those voices was in dire need. Once arrived on the scene, the brave men from MHS made an incredible rescue right there in the backyard. They found that a stray dog named Raina had brought a litter of eleven babies into the world, and had dug a hole for them, in an attempt to keep them safe from the sudden flooding. By the time the MHS team arrived, Raina and her puppies were taking cover deep down in the muddy pit. After spending hours trying to lure Raina out, the MHS heroes finally did, comforted her and assured her that she and her puppies were in safe hands. That day, the courageous doggie and her adorable puppies were completely recovered, safe and sound. After arriving at the shelter, receiving vaccinations and medical care, and getting proper food, it was time to find them some appropriate owners, who’ll care for them forever. 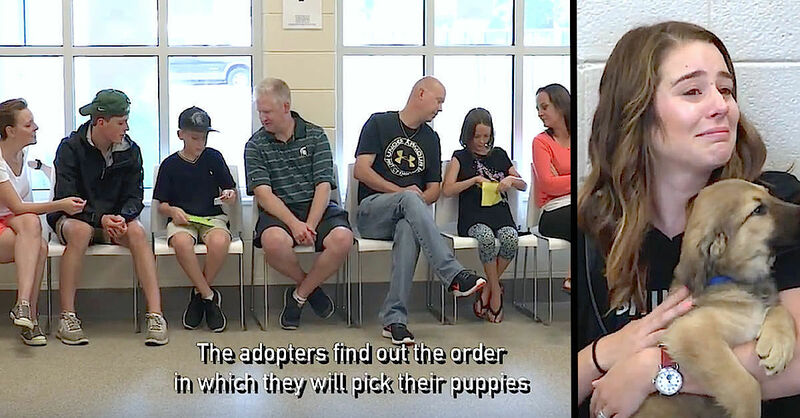 You can check the video below, to see how the fortunate adopters are lined up in the waiting area. The thing is, each one of them has already committed to taking in a puppy, but nobody has any idea which one will it be. The MHS team just randomly assigned a specific number to each family, indicating the order in which they will get the chance to pick their new family member. And the results are more overwhelming and more touching than you will ever expect.